This is a foreign exchange guide to Chile, the Chilean Peso currency plus CLP transfers and travel tips. Chilean Peso exchange rates - latest & historic exchange rates. What is the Chilean Peso currency code and symbol? The three letter currency code for the Chilean Peso is CLP and the symbol is $. Which countries use the Chilean Peso? It is the domestic currency in Chile. The interactive chart below shows the USD to CLP exchange rate for the previous 3 months with rate alerts for days when the exchange rate moved up or down significantly or for 30 day highs and lows. Chile is one of the most slender countries in the world — just 150 miles across at its widest point. From the snow-capped volcanoes of Patagonia and blistering heights of the Andes to world-class wineries and Maoi sculptures of Easter Island. Diverse landscapes unfurl over a 4300km stretch: parched dunes, fertile valleys, volcanoes, ancient forests, massive glaciers and fjords. There's wonder in every detail and nature on a symphonic scale. For the traveler, it's mind-boggling to find this great wilderness so intact. Development could imperil these treasures sooner than we think. Yet for now, Chile guards some of the most pristine parts of our planet, and they shouldn't be missed. 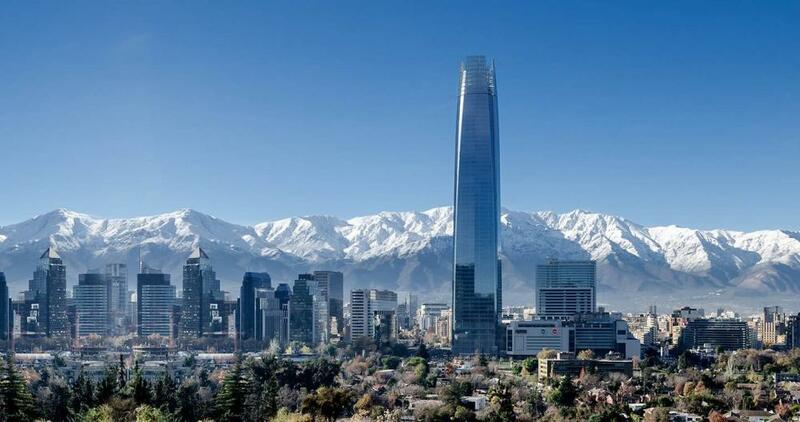 And yet it is also one of the most developed South American countries, its capital Santiago is a tech hub for the region. What currency should I use in Chile? The currency of Chile is the Chilean Peso (CLP or CL$). You can exchange currency at the airport or many large hotels have currency exchange outlets. However neither of these will give particularly good transfer rates. ATMs will generally give the best rates but only if you choose to be charged in the local currency. ATMs are easy to find, even in the country areas, however they do tend to run out of cash later on in the day. Some accept certain cards whiles accept different cards so be sure to check the signs. Paying by cash is by far the best option in Chile. Visa, MasterCard and AmEx are widely accepted, but only in major cities and tourist hotspots. Banks are open during the week from 9 am to 2 pm but ATM are accessible 24 hours a day except in some small localities. Asking a bank clerk to exchange money is rather uncertain. Some banks offer it, others do not. What is the best way to get around in Chile? Chile is a very fun country to get around in, most the forms of transport are comfortable, reliable, and not expensive. Which is handy since Chile is a very large country. The most common form of transport, especially for the locals is to go by bus. The bus system covers most places and is very cheap so is a great way to get around. It is quite comfortable as well, usually with plenty of space with reclining seats and flexible timetables. They all have toilets and some even include meals. Also, as there is so much competition, the bus fares are quite cheap so it makes for a wonderful way to get around. Chile is a vast country so if you have the time taking the bus makes for a comfortable and charming way to take in the views. Due to lack of use the train system has become slower and more unreliable. If you need to cover larger distances in a hurry the flights in Chile are quite convenient as since the country is so large and you may want to take in both north and south in your trip with limited time. The flights can be expensive however, Low-cost airlines are driving down flight costs in Chile. Sky Airline tends to have good one-way prices. The best rates with LATAM are found on its Chilean website, accessed only in-country, where weekly specials give cut-rate deals with as much as 40% off, especially on well-traveled routes such as Puerto Montt to Punta Arenas. Booking ahead and buying round-trips save money. The main airlines are LAN and Sky Airline. In Chile, adventure is what happens on the way to having an adventure. Pedal the chunky gravel of the Carretera Austral and end up sharing a ferry with SUVs and oxcarts, or take a wrong turn and find heaven in an anonymous orchard. Plans may be made, but try being just as open to experience. Locals never rush, so maybe you shouldn’t either. 'Those who hurry waste their time,' is the Patagonian saying that would serve well as a traveler's mantra. Spanish is the official language of Chile and is understood by most residents. English is taught in schools so many younger people are able to communicate to some degree. Of the older residents only those working in the tourist industry are likely to understand English, mainly in the larger cities. The central region of Chile experiences a climate much like that of the Mediterranean coastline with warm, dry summers, and moderately wet, cool winters. Though quite rare on the coast, this central region is susceptible to light snow and frost further inland. Save money and time by Ordering your Chilean Peso online from Travelex, you get better rates and can pick up the CLP cash locally or even on travel day at the airport. For card purchases if offered a choice of currencies always select to Pay in Chilean Peso otherwise you may get much worst exchange rates. Compare CLP travel cash rates - probably why you are here! When searching around for information on how to get a good exchange rate when sending money to Chile you need to start with finding out the latest Chilean Peso foreign-transfer exchange rate. Once your funds are received by the provider the converted CLP amount will be transfered to the recipient account you specify in Chile. Use our Send to CLP calculator to compare the exchange rates of FX specialist providers rates versus your bank's standard rates you can hopefully save around 5% and maybe more - end result is more Chilean Peso deposited into the recipient bank account and less margins and fees kept by the banks!